When thinking of alphabet E, the choices were many. I had plans to make Empanada, but that is already made and blogged about. Then I wanted to make something with Ellu (sesame), but had better plans for its usage. 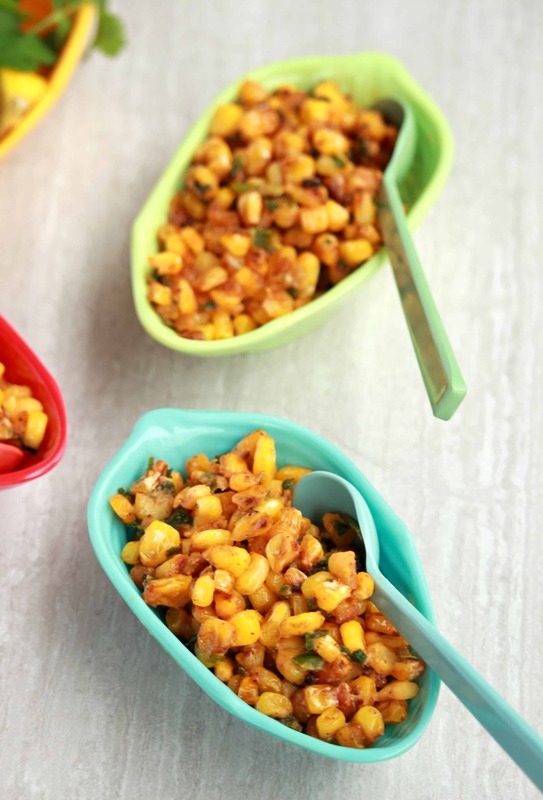 That is how I landed on the this, Esquites | Creamy Mexican Street Corn Salad. 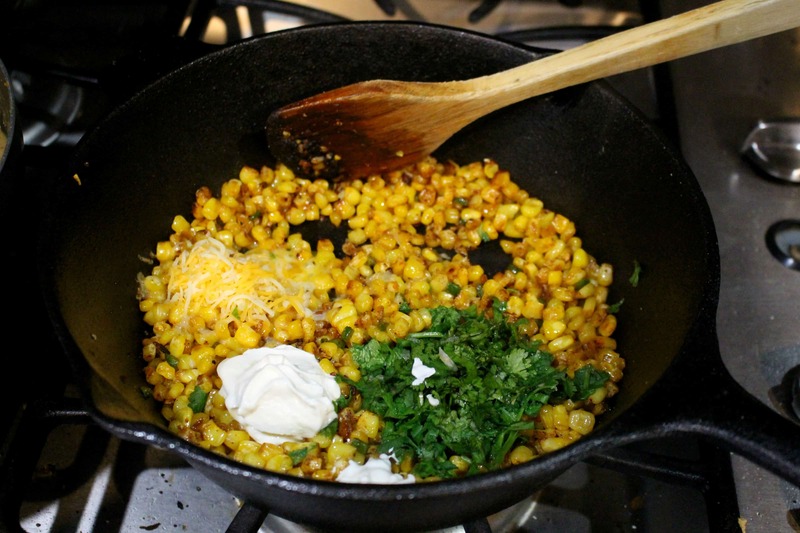 Everything seemed right about this Creamy Mexican Street Corn Salad. I knew the boys would love it. I had all the ingredients that I needed, but I postponed making it for so long. We traveled all last week. My Elder son sang at a very prestigious Indian Music festival that happens at Cleveland every year and we were gone all week for that. I came back and the schools remained closed because of the teacher’s strike. 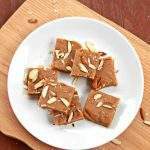 It just felt that the days were moving so fast and before I knew it I was writing the recipe for alphabet D – Double Ka Meetha. I learned one thing, never postpone a dish thinking it is a easy one and can be made in few minutes. You never know what will come and even a pleasurable, easy recipe will feel like a big job. 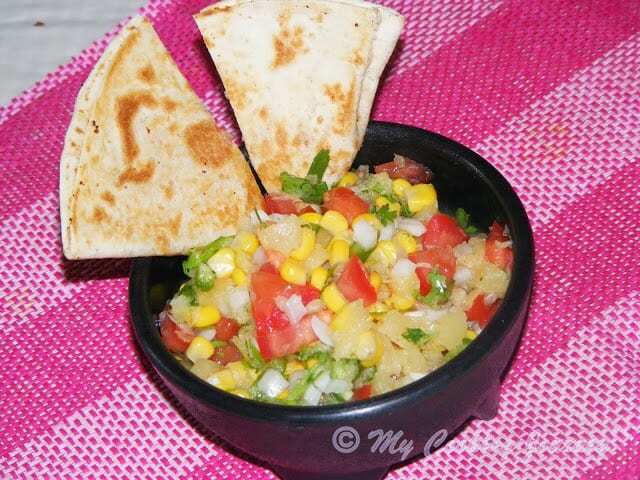 I quickly made the Esquites | Creamy Mexican Street Corn Salad, yesterday for lunch along with roti and Mixed Vegetable Kurma. The boys were really excited to eat the salad, just as I expected, but were very upset that I did not make enough to eat for snack that afternoon. That is a good problem to have and I promised the boys that I will make this for their lunch boxes right after school re-opens. Not sure when that is going to happen. Our districts have declared that the school is still closed for Monday. As I am writing this, I am planning on what to cook on Monday that will satisfy the boys and also work on my favor. This Esquites | Creamy Mexican Street Corn Salad is a very simple and quick to make. 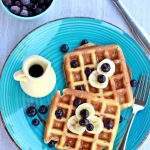 It takes 20 minutes from start to finish and the best part is we can make it year around using frozen corn kernels. Once summer is here, I will be making it with fresh corn. If you have canned corn in your pantry, go ahead and use that. It will taste just as good. The only trick to make it taste awesome is to let the corn caramelize and get a light char all around. I used frozen corn to make the Esquites | Creamy Mexican Street Corn Salad. Heat a heavy pan, preferably a cast iron pan on medium high heat. 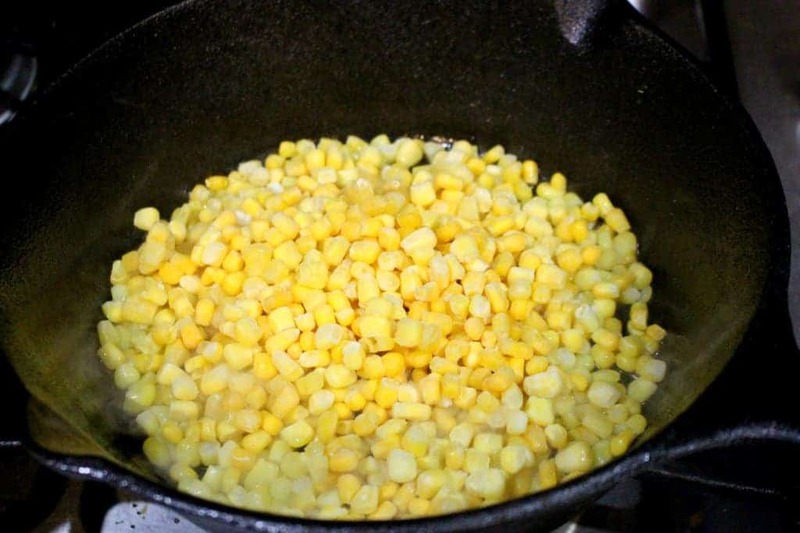 Add the oil to the pan and when the oil starts to smoke, add the frozen corn kernels. Mix it well and let it caramelize / roast on one side. Then mix it well and let it roast on the other side. I left it for 3 to 4 minutes without disturbing and then mixed it and did the same until it was uniformly caramelized all over. At the end of the cooking time add the minced garlic, jalapeno, chili powder and salt and mix well. Let it cook for a minute and then turn off the flame. Add the sour cream, lemon juice, cilantro and cheese and mix it well. 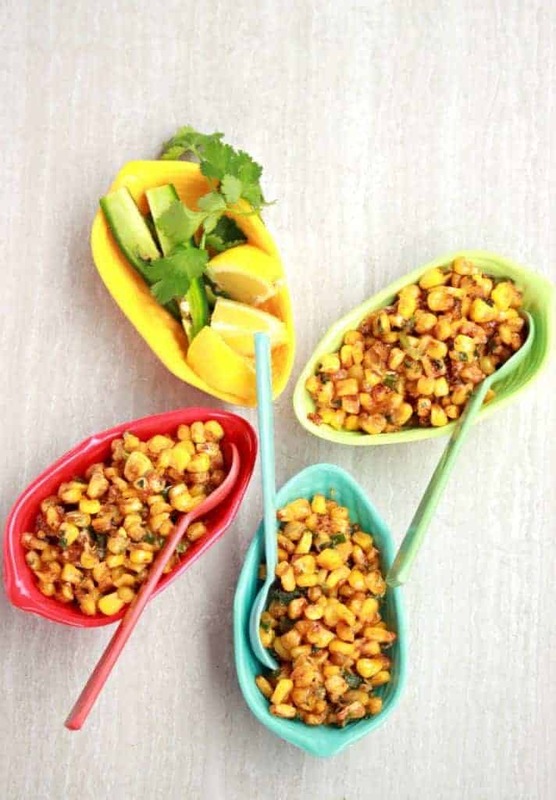 I used frozen corn kernels to make the Esquites | Creamy Mexican Street Corn Salad. It worked great. You could use fresh corn kernels or canned ones as well. 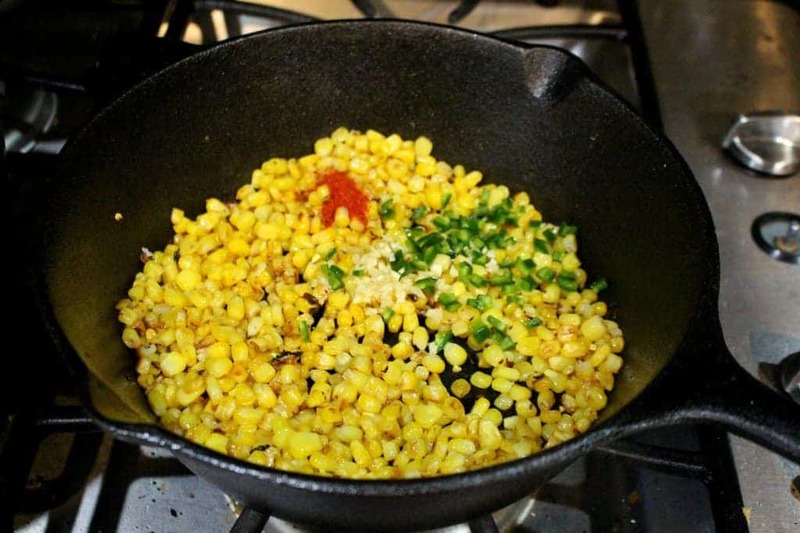 Make sure that you let the corn get a slight char all over. That makes the Esquites very flavorful. The actual recipe calls for crumbly Mexican cheese like cotija. Feta would work well as well. I ran out of my feta stock and hence uses Mexican blend cheese. Don’t skip the chili powder. It adds a zing to the salad. We could use mayonnaise or Greek yogurt instead of sour cream. We could skip it altogether as well. Don't skip the chili powder. It adds a zing to the salad. Am just drooling over that bowl of delicious corn salad, i have some weakness for corn kernels. Now am so much tempted to make this Esquites as soon as possible. 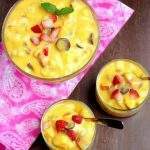 Delicious creamy corn salad. I am sure my daughter who is a great fan of corn would love it. 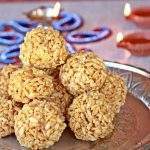 What an addictive snack this is Sandhya. We all corn in any shape or form in my house and this looks a delicious dish to make for them. In fact I had Esquites listed out for one of the weeks but it didn’t make the short list. Now I’m thinking may be I should put it back ‘cos it’s so easy to make and seems to be a crowd pleaser. Corn Salad looks so creamy and delicious. Really like the flavors get into this salad and i’m sure that i will love it. Have a couple of corn at refrigerator, will give it a try !! Omg !! 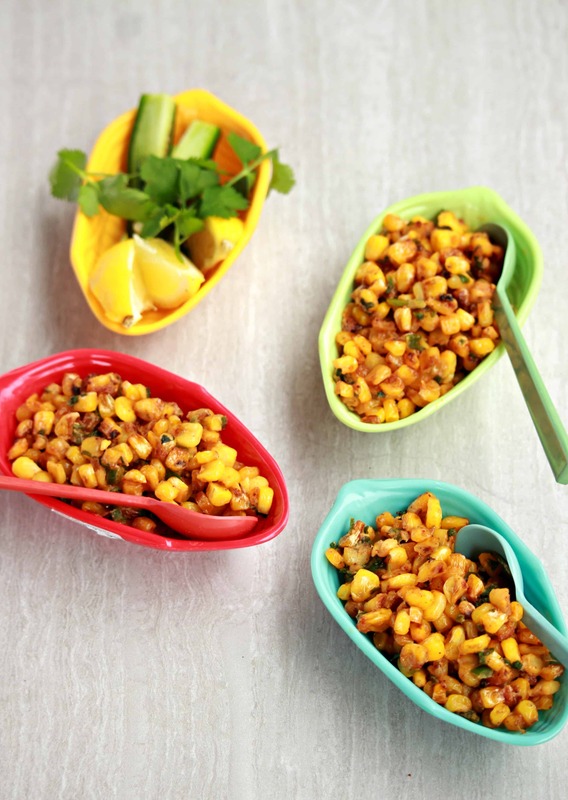 these Caramalised corn salad looks just fantastic, what a wonderful choice for the letter E sandhya.. This looks like such an addictive salad, and am tempted.. Such proud moment sandhya congratulations to you and your son, this is a perfect treat for them. Agree Deciding what to cook for lunch boxes is a task for sure.. The serveware looks so cute..with sweetcorn in it im definitely doing this..
Yea this would have been good but for another day for me, I was so glad I made the empadas..though this would have been equally loved! That is a beautiful and delicious salad Sandhya! No wonder teh kids wanted more. 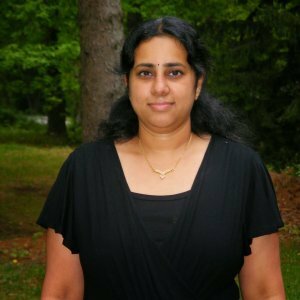 Saw this on Kalyanis blog as well. 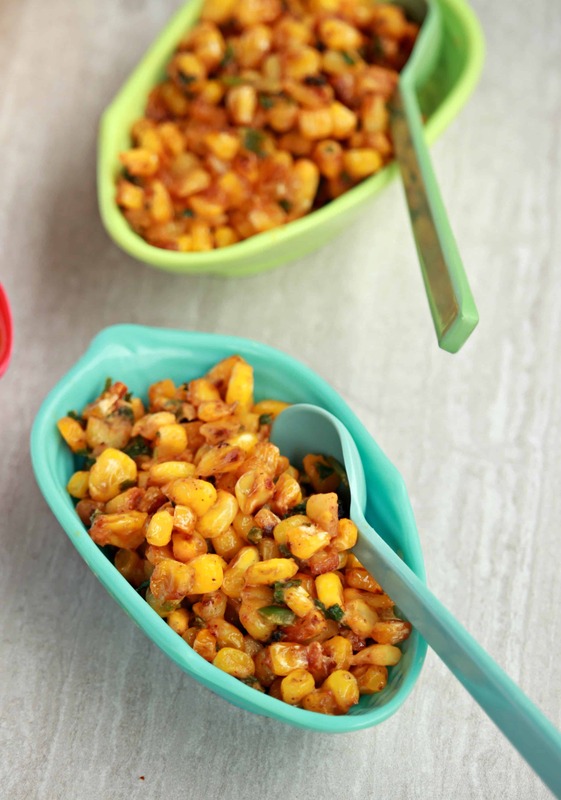 I am planning to make this as my kids love sweet corn. Warm corn salad is something I love the most and this creamy Mexican style salad is just calling my name. I am literally drooling Sandhya. Agree with you sandhya about not postponing the recipe. Sometimes the simple ones will sodapify to core. 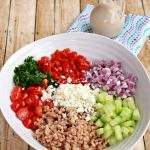 This salad looks inviting and those colorful bowls are cute. You’re so right Sandhya, don’t postpone what can be done now. Work from nowhere tends to appear and then what we had postponed gets ahead of us and it becomes difficult to complete tasks on time. I love your esquites with sour cream. Never tasted it but will try it out soon. Another Mexican salad for today! Looks very colorful sandhya! 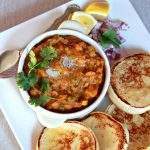 I can enjoy this as such for dinner, love such simple, no fuss recipes! This looks so good! We have a lot of corn in my house, and this is a fun way to try it! My son is crazy about anything corn. I must make this for him. 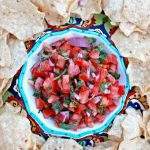 I’m a huge fan of Mexican food so this would make a perfect snack for us in our home. Like how colorful and easy this is to make Sandhya. Can’t wait to try it soon. LOVE Street Corn EVERYTHING. I just picked some corn up while grocery shopping yesterday. Grilling season is FINALLY here, and we love to cook it outside. I know it would be perfect in this super delicious side dish. Perfect for all the summer parties. 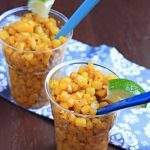 Mexican street corn are best, I love them Your version looks perfect creamy with lot of flavors. I can eat every day. This sounds so good! 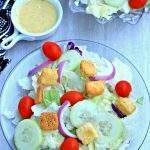 Perfect side for summer cookouts…I will be giving this a try this season. I know my family will love it! What a fantastic summer salad. Whenever I think of corn I think of hot days and picnics!! The street dish is filled with delicious flavors. I’ve never had this street salad before but I’m planning on making it as soon as I can.